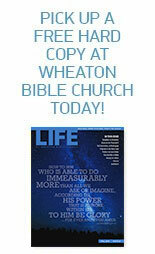 Did a story in LIFE at Wheaton Bible Church speak to your heart? Was there something we missed? Do you have another perspective? Got ideas for future articles? Please send us an email at LIFEcomments@wheatonbible.org, fill out the form below, or drop a note for the editor at the Welcome Desk at Wheaton Bible Church.